Rebecca James had lived on the adrenaline of the high risk adventures she took. Until that last fateful climb where her partner had fallen to his death. She couldn't remember what had happened, had barely functioned enough to get out. She had been cleared, there was no suspicion, but Becki needed to know. She needed answers from the nightmares she relived. She knew she couldn't climb, but the drive was still in her. She had agreed to come teach in Banff at a training center she had once attended as a student. She never expected to see the man who had never quite left her memories. Marcus Landers may have a physical injury that sidelined his career, but he had turned that into a new opportunity. He had started Lifeline, and hired only the best of the best. They were used in high risk rescue operations that few could successfully attempt. His team was good, the best, but even the best required ongoing training. He had set their headquarters near his brother's training center, and they used it often. He was surprised to discover Becki had returned. The attraction between them still burned as bright as, if not brighter than, before. 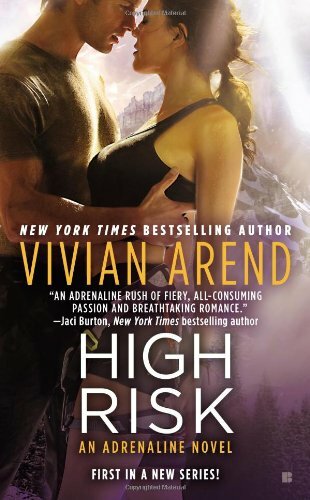 Not only is High Risk the first in Vivan Arend's new Adrenaline series, but it is an adrenaline rush for the readers from cover to cover. The characters are constantly in motion, whether scaling a wall, lowering from a helicopter, or acknowledging the attraction that burns between them - which makes for a fast paced read. Marcus was a surprise, although he had lost part of his arm, his complete acceptance was somewhat unique compared to other novels. He may have had to make some adjustments, but that was that. His steadiness and expertise were exactly what Becki needed in helping her overcome her own experience. They were perfect together - both in their personal, and professional lives.